This cold-smoked, thin sliced red king salmon is mild and silky. Neither salty nor sweet, what separates our lox from the rest is the flavor of the Alderwood smoke. Better than any lox you have ever tasted!! 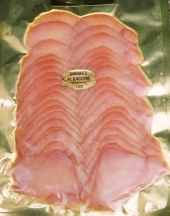 Lightly cold smoked and thinly sliced, this white king salmon has a delicate flavor and a beautiful buttery texture. Very elegant. A must try for any smoked salmon afficionado. 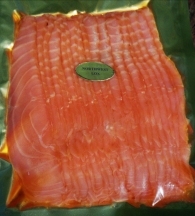 Cold smoked, thin sliced Alaskan salmon with an intensely deep red color and big, bold salmon flavor. Cold smoked over alderwood fire and thinly sliced. This albacore tuna is velvety and mild. We'll bet you've never had anything like it. 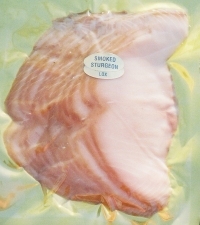 Beautiful, cold smoked, thin sliced wild sturgeon with a texture and a richness like proscuitto.